Cyprus’ Natural Gas Public Company, DEFA, has transformed its mission over the past 11 years since its founding, from gas distribution and import, to energy security and a clean future. Under Chairman Dr. Symeon Kassianides’ leadership, the organisation is taking the first step on this ambitious path, by developing natural gas infrastructure and procuring long-term suppliers. Dr. Symeon Kassianides is Chairman of DEFA – also referred to as Cygas – Cyprus’ Natural Gas Public Company. He is also Founder and Chairman of Hyperion Systems Engineering Group. He received a BSc in chemical engineering from Massachusetts Institute of Technology, and a PhD in chemical engineering from Imperial College London. When drilling began on the Aphrodite gas field in Cypriot waters in 2011, expectations were high. Initial tests revealed an estimated 5 to 8 trillion cubic feet of gas resting in Cyprus’ Exclusive Economic Zone. While subsequent studies downsized expections to 4 tcf, optimism remained. However, the Aphrodite gas has yet to come ashore, and Cyprus — 7 years later — remains over-reliant on fossil fuels, and is isolated from European energy markets. Cyprus’ Natural Gas Public Company, DEFA, is working on a project to change that. The CyprusGas2EU project, which is in fact a European Union Project of Common Interest, is devoted to ending the island-nation’s energy isolation, and enabling the import of LNG for power generation – with the reduction in energy costs and CO2 emissions that this entails. 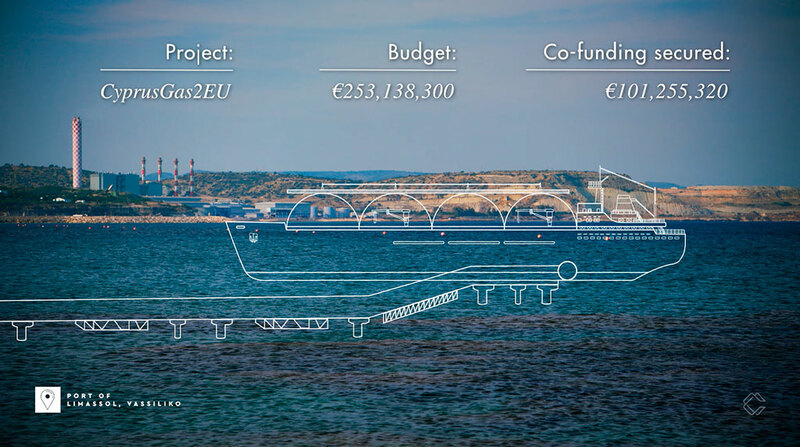 The project has two main phases: firstly, procuring a floating storage and regasification unit (FSRU) to enable the import of gas to Cyprus — along with marine works and other permanent infrastructure, like a gas transmission pipeline that will transfer the natural gas to the power station adjacent to the proposed project site — and, subsequently, procuring the gas in LNG form for importation. “[We’re] isolated,” said DEFA Chairman Dr. Symeon Kassianides. “We’re trying to break this isolation by actually making the right kind of infrastructure and the right kind of channels in order to be able to have gas flowing” — regardless of whether or when the Aphrodite field will prove fruitful. In October, DEFA published the tender documents for the LNG import terminal at the port of Vassiliko that will include the FSRU. A second tender for the mid-to-long term supply of LNG is expected in 2019 – after the infrastructure has been awarded – tailored to concrete delivery times and the actual size of the vessel. Kassianides explained that disengaging supply and infrastructure, is a key differentiating element of this project, and an aspect – he believes – that will contribute to the project’s success. Development will hopefully start in early 2019, stated Kassianides confidently, and be complete by November 2020. Given the ambitious timeline, “timing is very important in the way that we will be evaluating the tenders,” he added. Luckily, DEFA is one step ahead on the financing component — the EU has awarded a 101 million euro grant for the 300 million euro project. The European Investment Bank has also expressed an interest in getting involved. “Our project is step zero,” explained Kassianides, “because we already have another project with the European Union called CYnergy.” CYnergy is a 7.5 million euro programme aimed at the wider establishment of an integrated storage, transmission and distribution system for natural gas in Cyprus. It’s looking into natural gas uses in the industrial sector, transportation and petrochemicals, to name just a few. “This [CyprusGas2EU] could lead as a stepping stone for the whole evolution of the Cypriot economy around a different fundamental basis,” said Kassianides. Over the past year and a half, under the leadership of Kassianides — who has been recognised multiple times for his contribution to the Cypriot economy as the Founder and Chairman of Hyperion Systems Engineering Group — DEFA has transformed from a gas distribution and import company to one that is leading the natural gas revolution in Cyprus, and looking to cement the country’s role in hydrocarbon development across the Eastern Mediterranean. As the “mother company of the infrastructure,” commented Kassianides, DEFA will have the role of transmission system operator, and will own the onshore pipeline. DEFA will also receive a 10-year monopoly exemption so it can fully focus on bringing gas to Cyprus without disputes over monopolistic activity. And regarding step zero — the LNG import project — DEFA is in talks with the Electricity Authority of Cyprus, as the latter is seeking to acquire up to 30 percent of the project’s equity. So, DEFA is working on something much larger than gas importation and distribution: It is trying to reduce energy prices, create security of supply via a connection to Europe, and increase the percentage of clean energy — cleaner than coal and oil at least — in Cyprus’ energy mix (which also happens to be aligned with the EU’s 2020 clean energy targets). At present, conventional fossil fuels account for approximately 90 per cent of the country’s electricity production. That is what led to the broader vision of security of supply. And that is what is going to make DEFA a leading player in natural gas infrastructure across the Eastern Mediterranean in the years to come.